Joe Fletcher was recently named as runner-up in the Male Referee of the Year category at the annual CONCACAF Awards after a fantastic 2016. The CONCACAF Awards honor players and achievements in CONCACAF-sanctioned tournaments and competitions involving the Confederation’s national teams at all levels. Performances also eligible for recognition include those achieved in professional club football leagues under CONCACAF’s stewardship in North America, Central America and the Caribbean, as well as the CONCACAF Champions League. 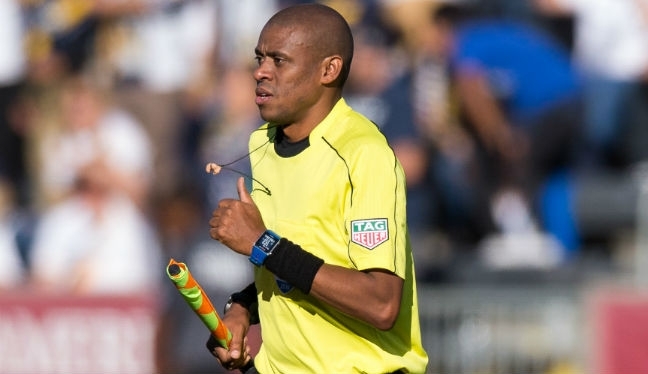 PRO’s experienced assistant referee finished second to Mexican referee Cesar Arturo Ramos and ahead of Joel Aguilar of El Salvador, paying tribute to both officials before expressing his delight at the honor. A Canada native, Fletcher wasn’t the only one from his country to be honored at the ceremony, with 23 Canadians nominated across 12 categories, something which makes the official proud of his roots and the talent coming out of the country. “I would be remiss if I didn’t acknowledge Cesar and Joel. While I haven’t been with Cesar before, I’ve been at multiple tournaments with Joel, and he is a class act. “It’s a tremendous honour to be recognized by CONCACAF in this fashion. Being an assistant referee, it comes with the job description that most ‘non-referees’ won’t know who we are. You don’t pick up a flag to be popular or noticed, and normally when you are, it’s for a mistake you have made. “So I look at this as an acknowledgement for all assistant referees, that putting your all into every match does get noticed, is appreciated and, for this special moment, also publically recognized. Fletcher’s fine year included Champions League, World Cup Qualifying and Copa America Centenario assignments, as well as taking the flag regularly during the MLS Regular Season, Playoffs and MLS Cup. There’s always room for improvement, however, at least in the eyes of the Canadian, who is already working hard on being in the best condition ahead of the upcoming season. The preparation will continue at PRO’s preseason camp, which gets under way in Los Angeles on January 27. Fitness work will step up with Sports Scientist Matt Hawkey putting the officials through their paces during the three-day program, but Fletcher knows the hard work will all be worth it come kickoff on March 3. “I’m not sure the ‘perfect year’ exists. Copa America was very special, as was the MLS Cup, both for varying reasons. At the same time I can easily look at my individual performances this year and pick out things I could have done better. “I could have been quicker to a decision, better positioned for another. It’s always a personal goal on a match to be above standard or very good in the work rate department. “It’s nice to take a moment to reflect on accomplishments and appreciate the recognition, but like everyone says, you’re only as good as your last game, so it’s on to 2017, starting with PRO preseason camp and our upcoming fitness test. We have an array of young talented ARs in our ranks who will make the test look easy, so I have to work hard to keep up to their pace. Greg Barkey, PRO’s Manager of Assistant Referees, added: “Joe is always looking for ways to improve, he studies the game beforehand, has an incredibly high work rate during the match and then does a complete review and self evaluation.